Yoga can have empowering emotional and spiritual effects. These more esoteric benefits are, however, closely interwoven with the physical effects of yoga. Yoga is a powerful tool at balancing the nervous system. Unlike other forms of exercise, yoga integrates physical poses, meditation, and breath. Yoga is not just a physical practice, and this is what makes it a unique way to calm the nervous system. Many people come to yoga for stress and anxiety relief, as well as healing for other health problems such as irritable bowel syndrome, depression, migraines, and so much more that are ultimately linked to the nervous system. The nervous system itself, and the ways that yoga interacts with the nervous system are complex and multivariable, and deserve further discussion. To understand yoga’s effects on the nervous system, it’s essential to have a grasp of the nervous system as a whole. You can conceptualize the nervous system as the body’s “electrical wiring,” although in reality it is much more complex. The nerves are what send messages across the body, such as pain, pleasure, and more. 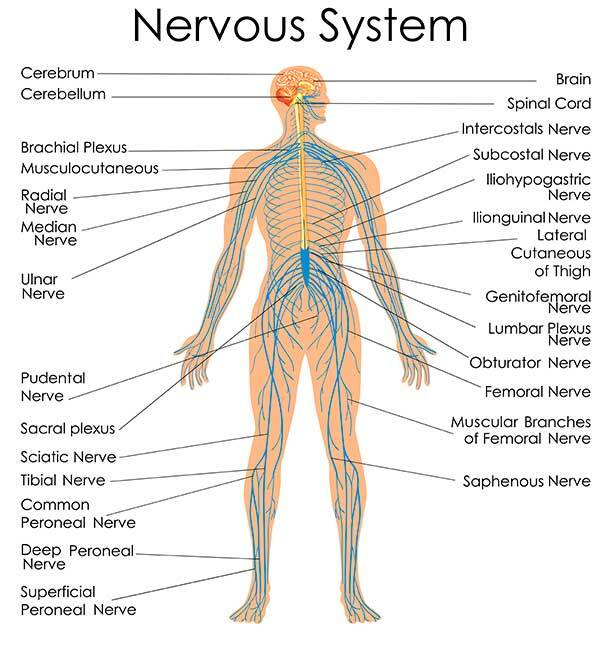 Physically, the nervous system consists of the central nervous system (the brain and spinal cord), and peripheral nervous system (all other nerves throughout the body). The peripheral nervous system sends a message to the central nervous system, for example when it touches something. The brain then decodes this message, for example comprehending that what you just touched was burning hot. It then sends electrical signals back through the peripheral nervous system with the appropriate response: to quickly release the hot item! Functionally, the nervous system consists of the somatic and autonomic nervous systems. The somatic nervous system involves controlled or voluntary movement, such as your decisions to walk or run or pick up items. The autonomic nervous system controls involuntary movement, such as organ processes, blood flow, heart rate, and digestions. Within the branch of the autonomic nervous system, there are two categories: the sympathetic and parasympathetic nervous systems. The sympathetic nervous system is colloquially known as “fight or flight,” whereas the parasympathetic is “rest and digest.” Many stress disorders result as an imbalance of the sympathetic and parasympathetic branches of the nervous system. Often, people end up in perpetual “fight or flight,” or an overactive sympathetic nervous system, which can lead to anxiety, stress, IBS, increased heart rate, tension, and much more. We now understand that many people come to yoga seeking help from stress, or overactive sympathetic nervous systems. But how exactly can yoga balance the sympathetic nervous system? Yoga regulates the activity of the sympathetic nervous system, restoring balance with the parasympathetic nervous system and enabling the “rest and digest” processes to take place again. It does this specifically by linking breath with movement. Slow, deep breaths such as the yogic ujjayi breath, activate nerve receptors in the diaphragm. This in turn activates the parasympathetic nervous system, thereby reducing the stress response of the sympathetic nervous system. Because yoga interlinks breath with movement, and places such a big emphasis on breathing, it is no surprise that it is a powerful tool in calming the nervous system. Multiple studies have shown that yoga can calm and rebalance the nervous system by other various mechanisms. These include changing the body’s perception of stress, increasing heart rate variability, increasing pain tolerance, lowering blood pressure, and more. There are many different styles of yoga, so you may wonder which style is most effective at calming the nervous system. Ultimately, all kinds of yoga will have a positive effect on the nervous system because they all link breath with movement. However, some types of yoga are more focused on calming and relaxing than others, such as the more vigorous styles of yoga. As such some styles be more appropriate if the yogi’s primary goal is to calm their nerves. Below are a few popular styles of yoga that are most effective at calming the nervous system. Yin yoga is a very slow moving and restorative style of yoga. It is usually taught as a series of passive postures, almost all of which are done on the floor or supine. Postures are held for long periods of time so as to target the deep muscles and fascia. 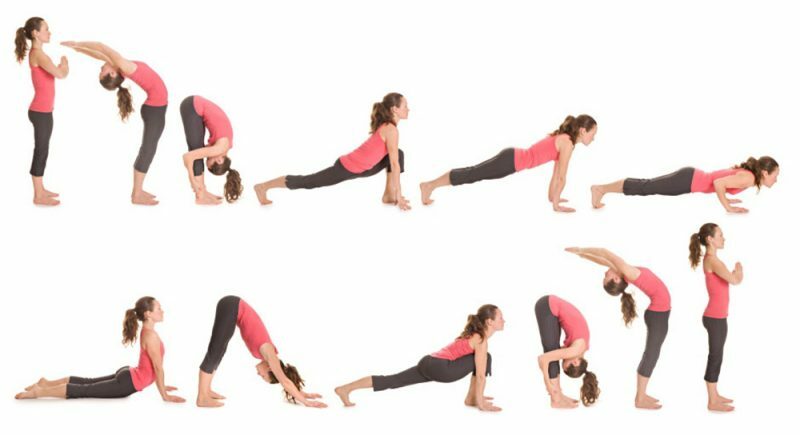 One class may only cover five poses, because each pose is held for so long. Because it is such a slow style of yoga, there is an emphasis on the breath and cultivating mindfulness. As such, it is one of the best styles of yoga to calm the sympathetic nervous system. Breathing is not necessarily a style of yoga, per se, but it is hugely important to a holistic yoga practice and is worthy of being practiced on its own. Yogic breathing is known as pranayama in Sanskrit and is the fourth limb of yoga. According to the yogic sage, Patanjali, there are eight limbs of yoga that are equally important. Although the physical poses, or asanas, which make up the third limb of yoga, are often emphasized in the West, pranayama deserves just as much focus. Breathing is unique because it is part of the autonomic nervous system, or in other words happens automatically, yet we still have voluntary control over the breath when we choose. As such, breath can actually be used to control and influence the autonomic nervous system. Specific pranayama techniques, such as nadi shodhana, or alternate nostril breathing, may be particularly calming. Meditation, or dhyana, is the seventh limb of yoga. 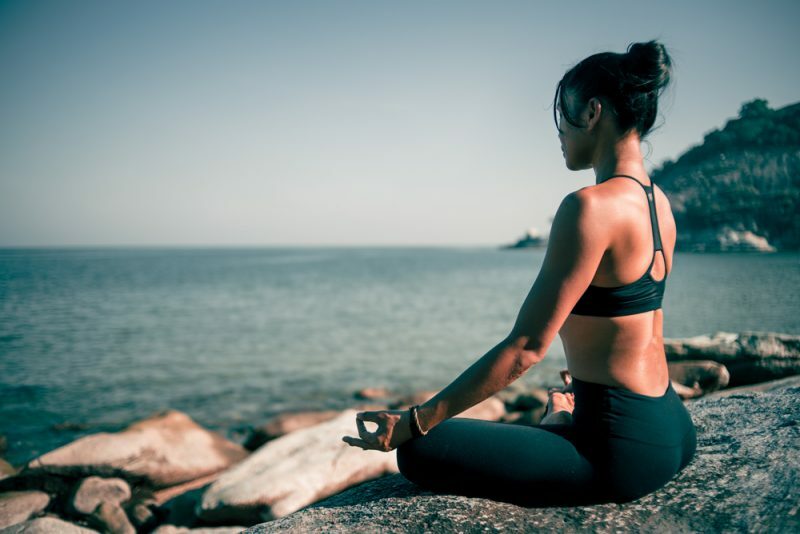 Just like the physical postures (asanas) and breathing techniques (pranayama), meditation deserves equal focus. Meditation involves sitting in contemplation, emptying the mind of all thoughts, until stillness of the mind is reached. Meditation has been practiced for eons, but recently scientific research has come out in support of its benefits. Particularly, research shows that meditation is clinically proven to relax the nervous system by lowering the body’s stress response, balancing stress hormones such as cortisol and adrenaline, and more. Yoga nidra actually means “sleep yoga,” but it is much more than just sleeping. In yoga nidra, the yogi reaches a deep state of meditation, similar to savasana which is often practiced at the end of a yoga class. Yoga nidra is sometimes compared to hypnosis, but the yogi is aware the entire time. When fully immersed in yoga nidra, the parasympathetic nervous system must take over. For many people with overactive stress responses and sympathetic nervous systems, this can help rebalance them and restore calm within the body. The following is a short sequence to calm the nervous system. It focuses on relaxing, accessible, and restorative postures. As you flow through these asanas, be sure to focus on your breath. If your breath becomes haggard or challenged, this is a sign that you should bow out of the pose and opt for something more restorative for your body instead. Honor your own personal edge and in doing so you will help restore balance to the autonomic nervous system. Begin your practice by focusing on unifying the breath and body. Sit in easy pose (sukhasana), by sitting cross legged on your mat. Your palms should be placed down on your knees, giving you a sense of grounding your body. To practice alternate nostril breathing, or nadi shodhana, gently bring your right hand to your nose. Use your thumb to block the right nostril, and breathe out through the left nostril. Now breathe in through the left nostril. When you reach the top of your inhale, block both nostrils. Switch so your pinky and ring finger are blocking the left nostril, and exhale through the right nostril. Inhale through the right nostril. Block both nostrils at the top, and switch. Continue this pattern, alternately breathing through each nostril, for 5-10 minutes. The most active and vigorous part of this practice is the sun salutations. It is also optional. You may practice either the sun salutations A, B, or both, depending on your energy level. Many types of restorative yoga skip the sun salutations, but there are nevertheless benefits of the sun salutations for the nervous system. For example, if you feel your body is buzzing or has excess energy, then the dynamic nature of the sun salutations may help you release this energy. From your final sun salutation, find yourself in downward facing dog. Inhale here, and then exhale and bend the knees deeply until they come all the way to the mat. Sit the bottom back on the heels and keep the arms extended out in front. This is child’s pose. Let your forehead ground into the mat, steadying your energy. Breathe deeply here for 5-10 breath counts. From child’s pose, inhale and sit up on your heels, using your hands to help you. Exhale and extend the legs straight out in front. Inhale and reach the arms up and overhead. Exhale and extend the arms and torso forward over your legs, hinging from the hips rather than rounding the spine. This is seated forward bend, or paschimottanasana, a very centering restorative posture. Breathe here for 5-10 breaths, feeling the backs of your legs release. From seated forward fold, inhale and use your hands to help you back up to sitting. Exhale and slowly lie back on your mat. Here, inhale and hug your knees into the chest, bringing your arms straight out to either side. Exhale the knees to the right, and the gaze to the left. Hold here for a few breaths, before repeating on the other side. Continue a few cycles of supine twist on each side, letting yourself relax into the pose, release the low belly muscles, and twist out your organs. From supine twist, inhale the knees back to center. Bring your arms down along your sides. Slowly extend the legs straight up, roll the shoulder blades under you, and use the hands to help support the low back as you lift the feet toward the ceiling. When you are in full posture, the hands support the low back and the body is extended in one strong, straight line. Shoulder stand is referred to by Patanjali as the “mother of all postures” for its many healing benefits. By reversing the flow of lymphatic and blood flow in the body, it is a rejuvenating posture for many internal organs. It is wonderful for digestion. By activating these organs, the pose also activates the parasympathetic nervous system, which balances out the sympathetic nervous system. Inhale in shoulder stand, and exhale and let the legs extend straight behind your head. Let the toes find the mat, and the sits bones reach toward the ceiling. You can keep your hands supporting the low back, or extend them, finding a clasp, and roll the shoulder blades underneath you. This is plow pose. Breathe deeply here for 10 breaths. To avoid neck injury, look straight ahead and do not turn the head to either side. Plow pose is a powerful pose for calming the nervous system as it regulates the breath and blood flow. This is one reason that it is typically practiced at the end of a yoga practice, the ready the body for savasana. From plow pose, inhale and then slowly exhale and roll the spine down to the mat. When the legs come straight up, hug the knees into the chest. When you are ready, inhale, and then exhale the legs straight down on the mat. Lie flat on your back with your shoulder blades rolled underneath you, opening up the chest. Let your feet relax and fall open. Place your palms up toward the ceiling. This is Savasana, also known as corpse pose. It represents the end of your practice, and your transition into life off the mat. Take a minimum of five minutes here, releasing any stray thoughts and letting your breath wash over you. As you flow through these poses, remember to listen to your body and your breath. With each pose, you will become more aware of your own personal mind chatter, or citta vritti. Try to let go of these excess thoughts, releasing them with each exhale. The nervous system is undoubtedly complex, but many of us struggle with the same common issue: an overactive sympathetic nervous system. Through physical yoga poses matched with intentional breath, this imbalance can be overcome. What Do Aum and Namaste Really Mean?